Here is the background information on World Vets and Pippa the Pencil Thief from the blog. This eBay auction has ended, thank you to all who participated. Stay tuned — future FUN fundraisers are planned! If you would prefer to donate directly to World Vets, they gratefully accept donations at any time. The World Vet teams work around the world, all year round. Donations help this important work continue. Click here to learn more about the work World Vets does to help animals and people. Help us spread the word this auction to raise funds for World Vets! Click on the entry form below to access the raffle. There are several ways to enter. (Logging in by itself is not counted as an entry.) No purchase necessary. One entry per each available option per day. Drawings (3 winners) will be at the conclusion of the eBay auction. Update: The winners have been notified, and prizes are on their way. Thanks for playing! 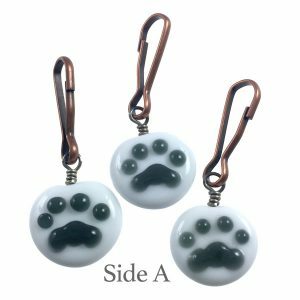 Each charm is made by me on a base of white glass with “Pippa Grey” for the paw print (a semi-opaque grey) and a bright red heart on the other side. Both the paw print and the heart were left raised. These are fun additions to your purse, a zipper pull*, or anything that needs a bit of Pippa Sass. 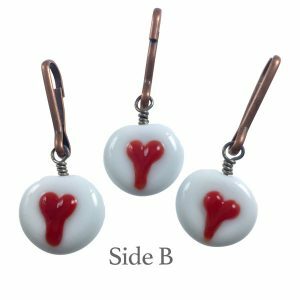 *If used as a zipper pull, grasp/pull using the copper clasp rather than the glass charm. The glass was melted directly on nichrome wire which creates a permanent fuse. 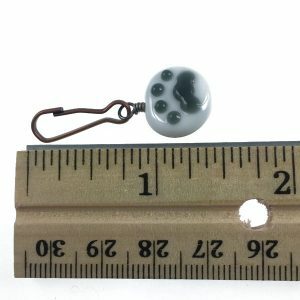 Each piece went into the kiln for 8 hours, then I wired up the loop and attached a copper clasp.